The humans are hungry again! Humans do like eat. 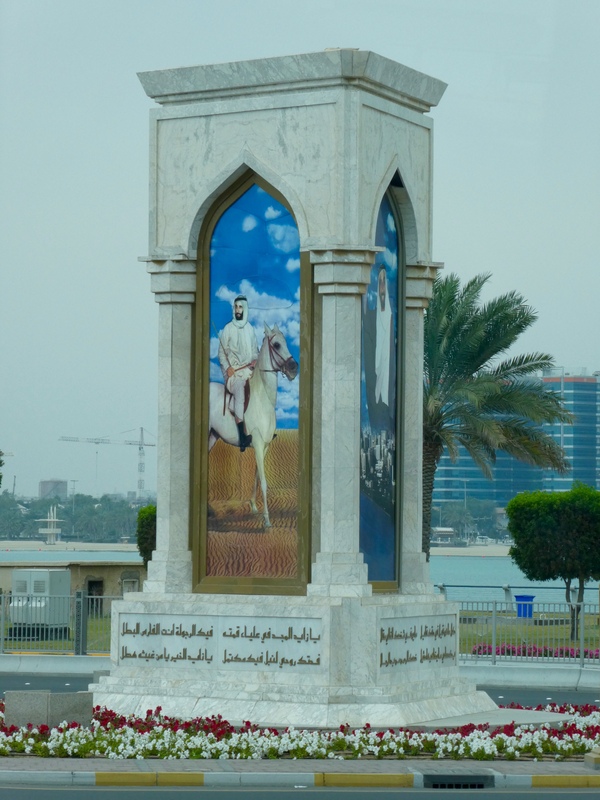 Tariq, our guide, says we will go to the mall and everybody can choose their preferred restaurant. What is this? I love ferris wheels, but mom says we do not have enough time. 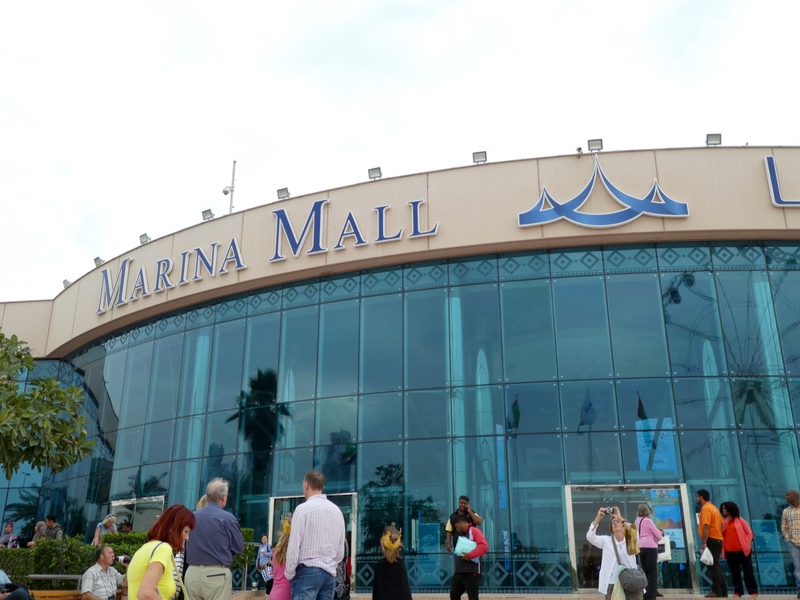 We enter Marina Mall in Abu Dhabi. This fountain is a little different than ours at home. The water comes from above, much like rain. 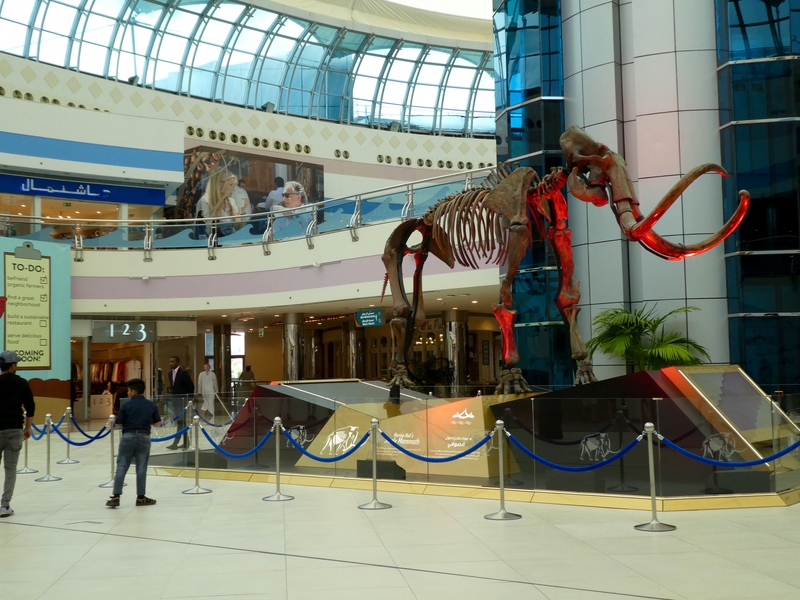 A dinosaur in the mall to promote another exhibit. Very interesting. Having lunch, the reason for this stop, leads us to this Lebanese restaurant. We order humus with chick peas. The humus, similar to paste, lines the bowl. Accompanied by a bowl of assorted olives, all very tasty, but not overwhelming our taste buds. The aroma of fresh, warm bread teases our senses. We eat the bread and then they brought another basket. Heavenly! 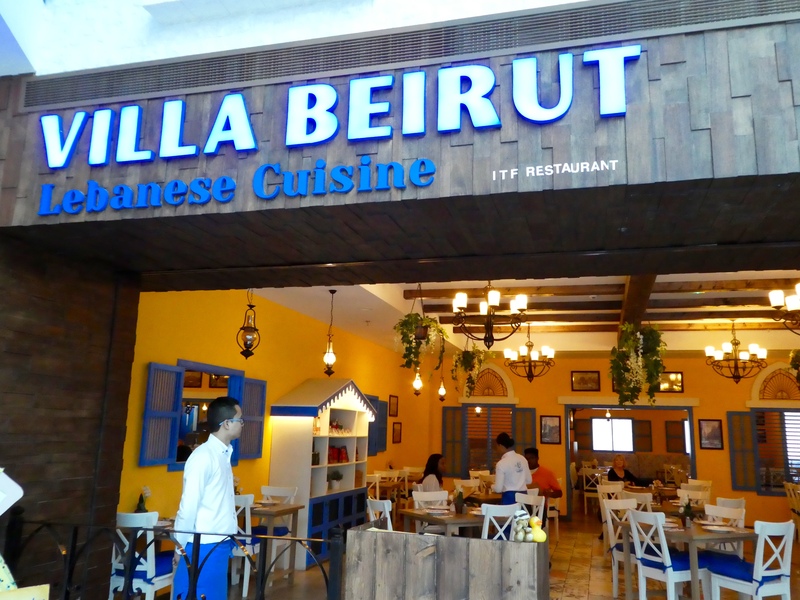 But, don’t forget, we are from the United States so we ordered French Fries from this Lebanese restaurants. Tasting perfect, they did not last long. And the Diet Cokes quenched our thirst. We also drank water with lemon. A perfect light lunch for humans, duck and bear. 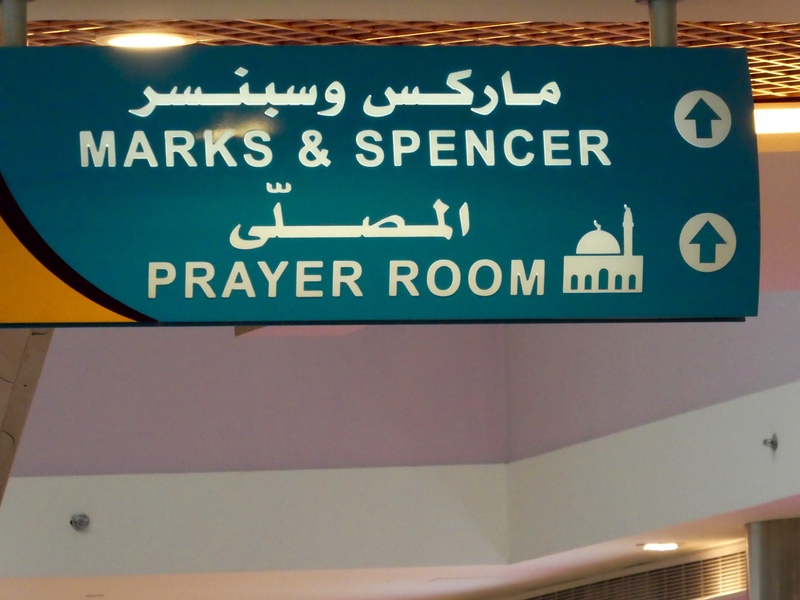 Wandering through the mall, we saw this sign. Rather common here, but not usual in our malls at home. 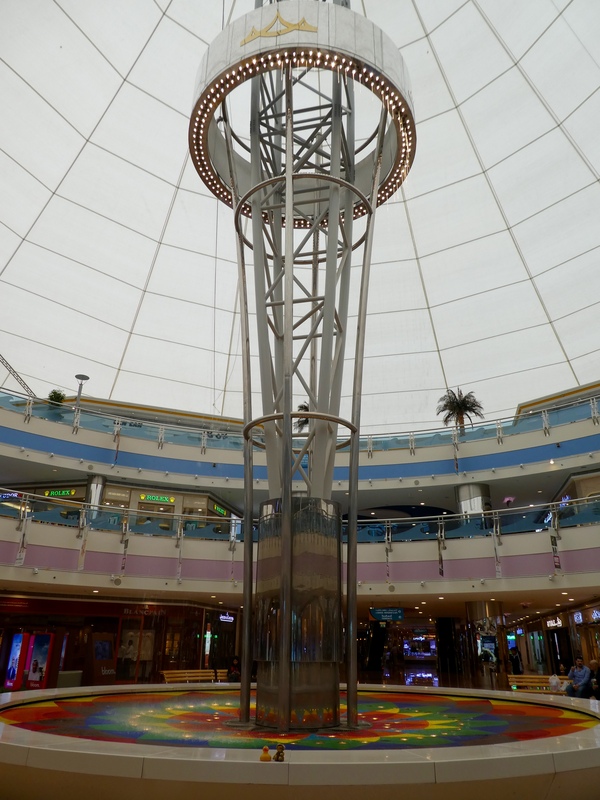 Leaving the mall, the column caught our attention. A tribute to the royal family, we think. 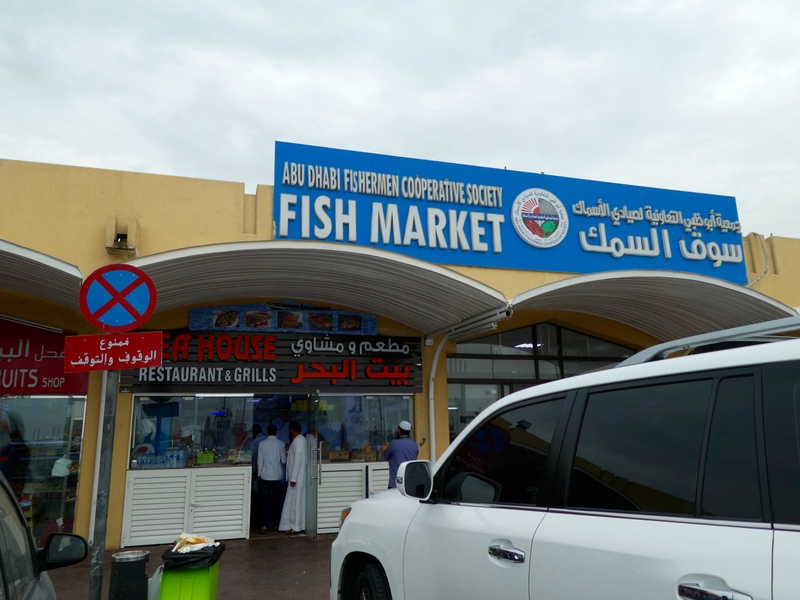 Next stop is the fish market of Abu Dhabi. 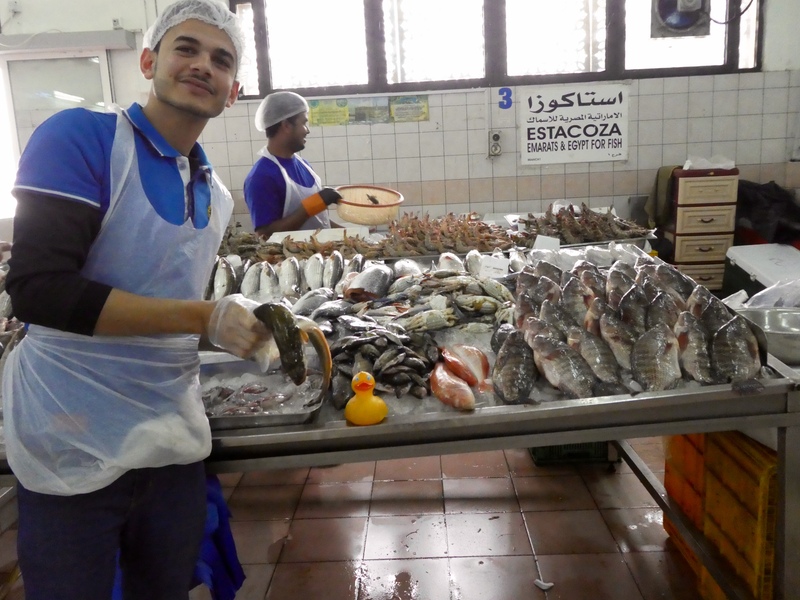 I wonder if this is like the fish market I visited last July in Maputo, Mozambique. Let’s go inside to see. Yes, it is. I love seeing the different kinds of fish. 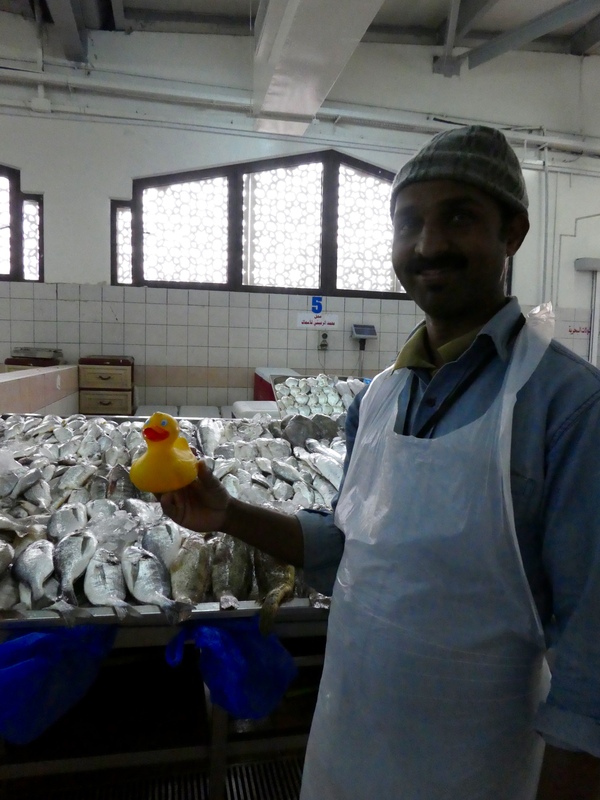 This man is showing me the fish. 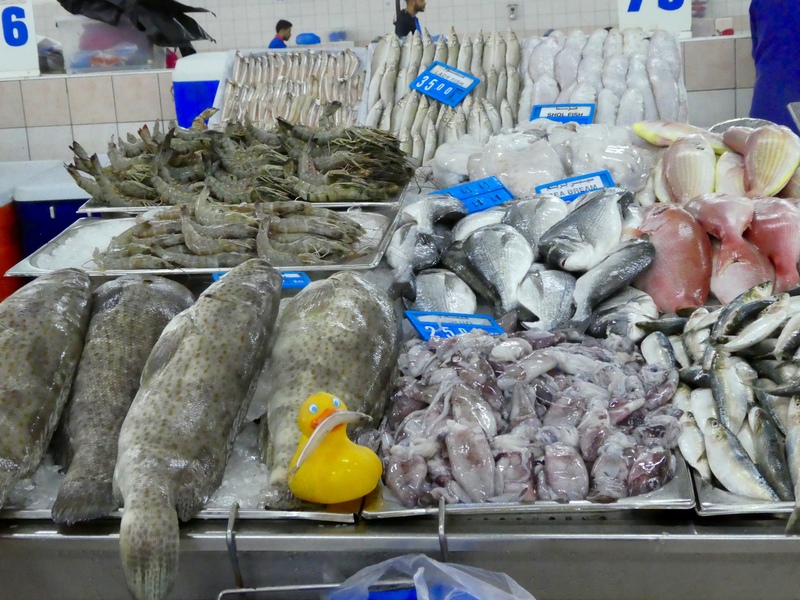 Another seller and I am with a human and more fish. Well, what is this he is bringing near me? I believe it is an eel. This man likes me, too. He thinks I might be hungry. Now, I, Zeb the Duck, am sampling a small fish. Very nice snack for me. Mom takes me to this display. 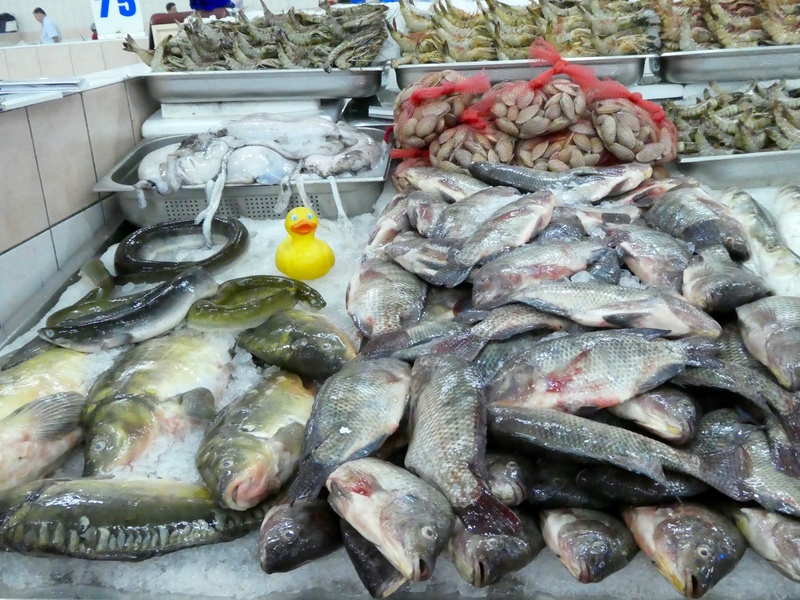 Some different kinds of fish here. 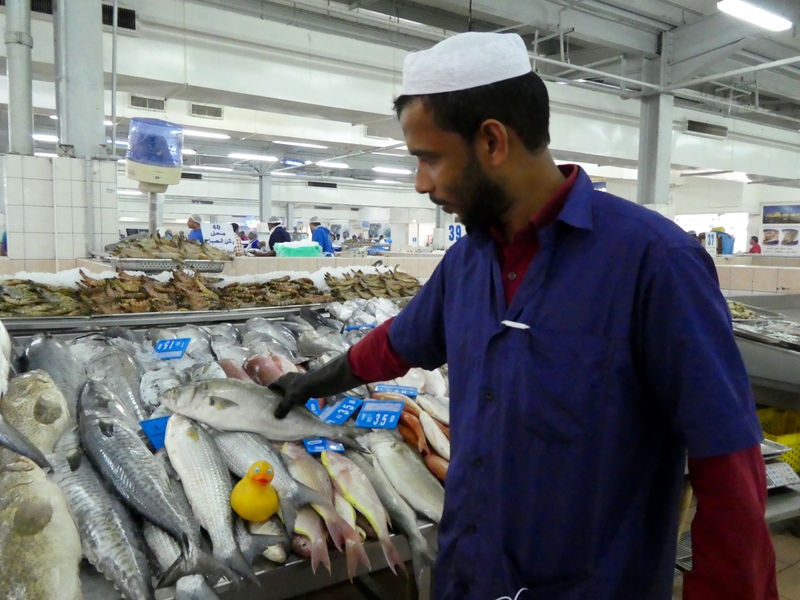 I like the fish market, and the sellers are always so nice to me. My friend, Chanel the Bear, is here also, but she is made of cloth. Mom can put me in a tub of soapy water and wash me. If Chanel sat with the fish, she would smell like fish for the entire trip. Maybe not a good idea, Chanel. We are happy you watched from your carrying bag. 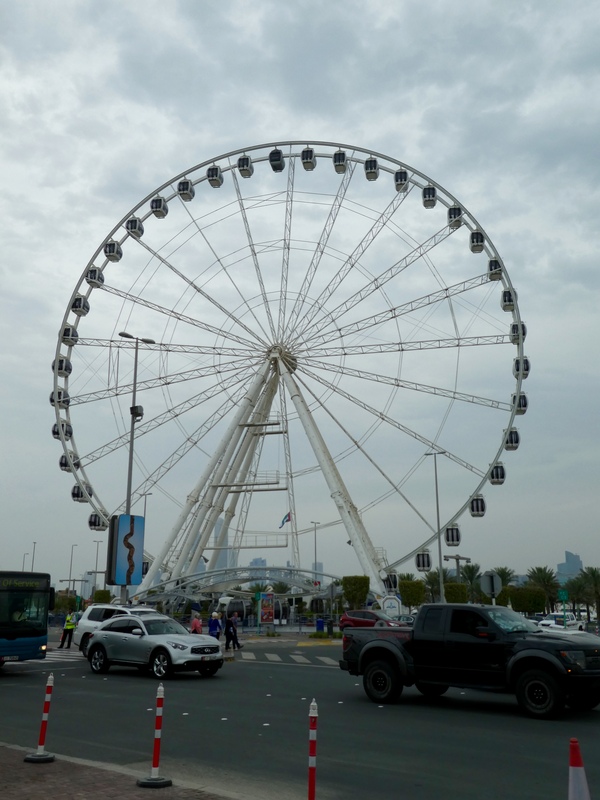 This entry was posted in Abu Dhabi, Uncategorized, United Arab Emirates and tagged Chanel the Bear, Colorado Traveling Ducks, dinosaur, ferris wheel, fish market, humus with chick peas, Marina Mall, United Arab Emirates, Villa Beirut. Bookmark the permalink. Zeb was right in the fish. And got a bath at the hotel. Would be fun to meet Manny. I would have gone on the ferris wheel! Would have loved to ride it.